Over 100 Senior Government officials and Ministers in charge of Lands and Mapping from Southern and Eastern Africa are meeting in Kasane, Botswana between 19 and 20 November, 2018. Ministers attending the 11th CoM included Hon. kefentse Mzwinila of Botswana, Maite Emily Nkaona-Mshabane of Republic of South Africa, Hon. Princess Persis Namugaz of Uganda, Hon. Douglas Karoro of Zambia and Hon. Purmanund Jhugroo of Mauritius. Lands Chief Administration Secretary (CAS) Hon. Gideon Mung'aro represented Kenya's Minister Hon. Farida Karoney. Other countries like Malawi, Zambia, Lesotho, Eswatini had budget presentations this week. Below the Conference of Ministers is the Governing Council that is composed of officials with the rank of Permanent Secretary/Surveyors General/National Mapping Agency Director General representing each Member State, and is the main policy and management organ of RCMRD. This meeting was preceded by the 52nd meetings of the Governing Council (GC) and its Committees that ended on November 16, 2018. As part of RCMRD governance structure the Conference of Ministers is its overall policy and political organ of RCMRD as well as a platform for promoting its activities at national and regional levels. It is composed of Ministers in charge of Lands and or National Mapping Institutions from the 20 member States. The main agenda of the Ministers meeting was to review and approve the new Strategic Plan for the period 2019-2022. The Minsters also assessed the performance of RCMRD in implementing its 2015-2018 Strategic Plan. 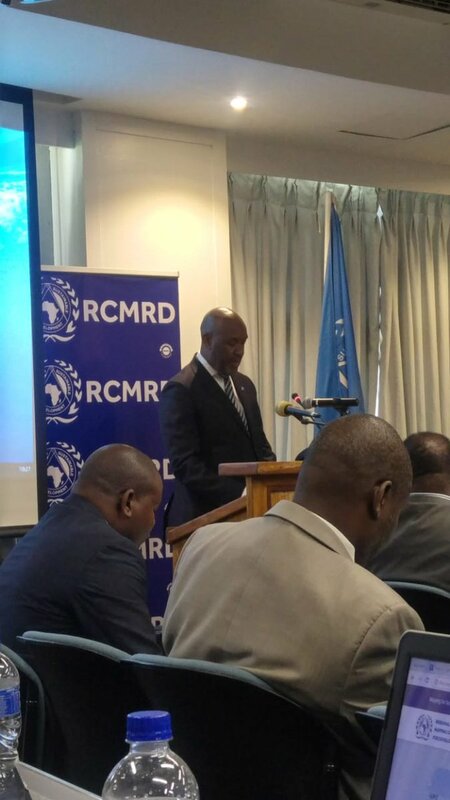 In a speech delivered on his behalf, the Vice President of the Republic of Botswana, Hon.Slumber Tsogwane, Hon.Onkokame Kitso Mokaila, Minister of Transport and Communications, conveyed his gratitude for the opportunity of welcoming RCMRD delegates to the 11th Conference of Ministers. "I warmly welcome the delegates to Kasane, Botswana." He further noted that His Excellency, the President of the Republic of Botswana, Dr. Mokgweetsi Eric Keabetswe Masisi in his Inauguration Speech stated that, “the management and use of land is paramount in determining the economic fortunes of the country”. Hence, he highlighted the role of the Africa we want and role of RCMRD in helping member States achieve the development goals of SDGs and AU 2063. In conclusion, he highlighted the role of ICT as the fourth industrial revolution and that it would help Africa achieve sustainable development. They reviewed the role of mapping, remote sensing and GIS in the promotion of the economic development, poverty reduction, environmental conservation, land management and administration in the region. Organised by the Regional Centre for Mapping of Resources for Development (RCMRD) in partnership with the Ministry of Land Management, Water and Sanitation Services. The meetings have been hosted in the City of Kasane. 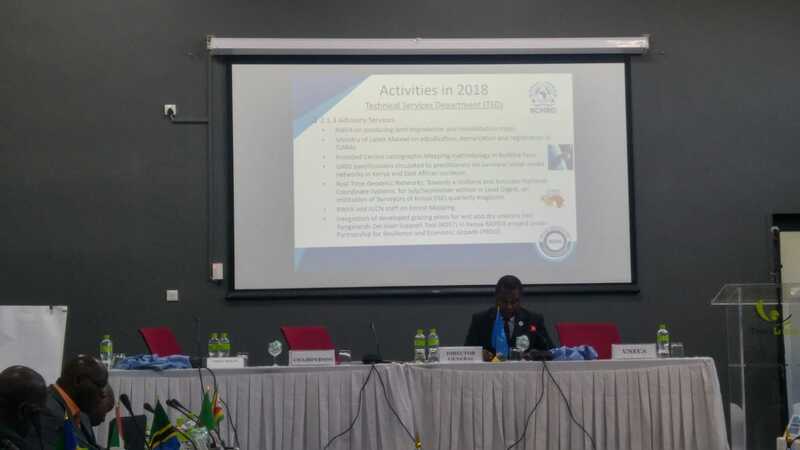 The meetings provided an opportunity for the countries of the region including Botswana the opportunity to share achievements of the RCMRD 2015-2018 Strategic Plan and future plans in the 2019-2022 plan. The Conference also reviewed the role of mapping, remote sensing and GIS in the promotion of the economic development, poverty reduction, environmental conservation, land management and administration in the region. Over the past year, the 20 member States have implemented programmes and activities aimed at increasing efficient management, utilisation and promotion of its natural resources, including land. Optron/Trimble Solutions was invited to attend the RCMRD 11th CoM and they made a presentation on Effective and Fit for Purpose Land Management done by Shayne Ashford, Optron South Africa. Dr. Joan Kagwanja of UNECA-ALPC presented on highlights of progress and plans on implementation of African Union Agenda on Land. Prof. John Kiema the Director of Technical Services at RCMRD presented on Mapping Using Unmanned Aerial Systems (UAS) while RCMRD's Business Development and Marketing Office made a case for Sentinel Datasets presented to member States and their Use and Application. The mission of RCMRD is to promote sustainable development through the generation, application and dissemination of geospatial information and allied ICT services and products in the member States and beyond. The mandate of RCMRD is to provide services to its Member States and clients in the fields of surveying, mapping, remote sensing, Geographical Information System, Information Technology and in natural resources and environmental management. The RCMRD Ministerial conference is gathered every two years and brings together Ministers in charge of Lands and Mapping from the 20 RCMRD member states, namely Botswana, Burundi, Comoros, Ethiopia, Kenya, Lesotho, Malawi, Mauritius, Namibia, Rwanda, Seychelles, Somalia, South Africa, Sudan, South Sudan, ESwatini, Tanzania, Uganda, Zambia and Zimbabwe.